Personalization is becoming a buzzword in the digital marketing space. As a result, lots of things are being said about it. We will look at all that is being said about content personalization and identity the reality versus the myth. This is a common misconception. Sure, building a software platform from scratch that allows content personalization would be extremely difficult, if not impossible, without any coding experience. However, the increase in demand for personalization has seen a rise in the number of companies offering personalization software. Although initially most of the software being offered was expensive and catered mostly to large enterprises with high marketing budgets, there are now an increasing number of options that target small and medium sized businesses. The bottom line, is that whatever your business size, market, or personalization need, there is almost certainly a personalization platform out there for you. If you are interested in finding out more about this, we wrote a blog post comparing 5 of the most popular personalization engines being used today. This is another misconception that prevents many smaller business from using personalization. As a matter of fact, companies with low web traffic are particularly encouraged to use content personalization. In B2B, the value of leads is higher, in that each lead has a higher customer lifetime value, than for the average B2C business. This means that each touchpoint – sales calls, offline interactions, emails, and even the website, need to be tailored perfectly to increase your chances of selling your product/ service. Content personalization addresses one of these touchpoints – your website. The first 10 seconds of a page visit is critical – that is when a visitor decides whether to leave or continue exploring the a website. If within those 10 seconds, the visitor does not find the exact information that they are looking for, or the language/tone/messaging does not engage them in any manner, they immediately leave the website. Content personalization helps address this problem, by giving you the best possible chance to turn every potential web visitor into a paying customer. Personalization does not need to be time consuming or expensive – there is an abundance of real-time personalization tools on the market to help. These applications are simple to use and require minimal effort. Setting-up the personalization is as simple as a few clicks. The provider of the personalization tool will have already handled all the complex coding – once you sign up for their service, they will send you a code snippet, and all you have to do is insert it into the header through the back-end of your website. The administration of the tool is just as easy. Just create your segments and choose your rules and you a pretty much good to go. In choosing your personalization tool, you will have the choice between one with manual administration, and one that does it automatically. The upside to doing it manually is that it tends to be cheaper, and you have more control over what you present to who. The upside to choosing a tool that automates the personalization is that it will save you time. The principles behind personalization that make big players succeed are not valid only for them – the same principles are effective for the majority of businesses, regardless of their size. Personalization works because it pushes the most relevant information to your consumer, at just the right time. These principles hold true regardless of what you sell to whom. Not only do you stand to gain from using content personalization, you also stand to lose from not using it. Three quarters of online consumers stated that they felt frustrated when encountering content irrelevant to their interests online. You don’t want your potential customers to be the one’s bouncing. You may not realize it, but your neighbours and competitors are starting to look into content personalization as a means to address the above problem of consumer frustration. You may want to think about personalization content too, or face the very real prospect of your consumers turning toward your competitor in search of a better user experience. You do, you just don’t know it yet. Think of the content that you have – it can likely be tweaked to meet the needs of a segment of your users. You probably already have some content that would be relevant to all of your user segments. Content personalization allows you to take that content and target it in a way that increases engagement with that particular set of visitors. This is exactly why Netflix uses content personalization. Content personalization has allowed them to succeed without constantly generating new content. They use content personalization to make users aware of content that they already have, content that they might not have noticed on their own. Even though big data and data sharing is an integral part of digital marketing, there are still many who are cautious when it comes to providing their personal information. 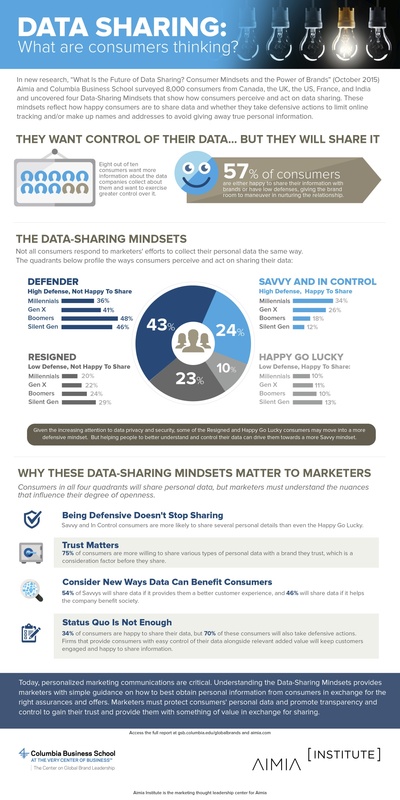 The infographic below profiles the ways that consumers perceive and act when it comes to their data. In a survey by Boxever, 61% of consumers want offers targeted to where they are and what they are doing and 56% of consumers want offers tailored to their interests and needs. Yet, 62% of consumers don’t want brands tracking their location and 49% of consumers don’t want to share their personal information. These statistics can be rather frustrating – it appears that while consumers want personalized offers they are also reluctant to share data that enables that personalization. The good news is that customers are willing to change their mind about sharing their data if they perceive that it benefits them to do so. A study by Microsoft backed up by another study done by Aimia and Columbia business school found a majority of consumers will share their data for rewards, cashback, coupons and location based discounts. When customers are faced with sharing their data, they always ask themselves “what’s in it for me”. When you personalize, you have to make this clear to your customer. In some cases, the benefits of sharing data are obvious. I will happily share my data with Google Maps in order to get better driving instructions. But when a recipe website asks for my location, I can’t think of any way that knowing where I am would help them optimize my experience. The main point to take away here is that customers are willing to share their information if they feel like doing so will benefit them. So as a marketer, you should make it clear what users get out of sharing their information with you. 7. I haven’t even used A/B testing yet, and you’re saying I should use content personalization? In short, yes! Content personalization is relatively easy to set up (see above), and actually a better starting point than A/B testing (see below). In other words, if you’re yet to try A/B testing or content personalization, it makes sense to begin with content personalization, and then implement A/B testing to validate your personalization strategy. Content personalization may seem complicated, but if you remove the online part of it, it’s extremely intuitive. If you owned a brick and mortar watch store, and a man comes in – would you show him women’s watches? No, you would show him watches that you think he will be interested in, based on the information that you can gather from him. It’s exactly the same concept when we personalize content for users online. It’s true, you’re not falling behind. Even exploring personalization as an opportunity for your business puts you slightly ahead of the game. Personalization is still very much in the 1.0 phase, with many businesses just starting to think about it. Only 29% of marketers today invest in website personalization and use of behavior-based data [insert link from salesforce marketing cloud]. As a result of its limited use, there are very few complete personalization strategies, as most marketers are still experimenting with new techniques in order to get the best results. However, the rate of which personalization is being adopted, it’s a certainty that companies that do not have it yet on their roadmap will be left behind by customers, competitors, and the entire industry. The most recent 2016 statistics show that 55% of organizations that are not using personalization today (or are only using it in email communications) plan to implement it next year. The speed at which a company sees results depends on the nature of their sales cycle. For a B2C retail company like Amazon, a short sales cycle means that the results would be quick and extremely easy to measure – one of the most important metrics for them is an increase in sales per user. If the results are measured by engagement, companies with a higher web traffic are likely to see the fruits of their personalization labor faster. This does not mean that smaller B2B companies will not see the same kind of results that the big retail companies will. Personalization for B2B businesses tends to take more time to yield results. The reason for this is that B2B businesses typically have extended sales cycles, which can span up to 24 months. And this means that it takes time to see the impact personalization is having on your bottom line – it may take 6-12 months to see a difference. Further, each contract may be worth millions, and many B2B businesses only get a few contracts over a period of months. Each touchpoint then, is extremely important, because for many B2B businesses, losing/ gaining one or two customers can be the difference between a good year and a bad one. In a saturated market place with many competitors, small things make a difference – and content personalization is there to help you get all the small things right. When you personalize, it’s important to not take it too far by personalizing your customers’ experience too narrowly – this is called a filter bubble. The problem with the filter bubble is that instead of helping your customers find what they need, you may actually prevent them from finding what they need, or even worse – showing them the opposite of what they need. Urban Outfitters experienced the filter bubble first-hand when they experimented with gender-based personalization. Their strategy seemed intuitive enough – show men’s clothes to men, and women’s clothes to women. However, as it turns out many women often bought men’s clothing and actually took offense to being profiled and targeted by gender. The underlying message here, is that before personalizing, your business must really understand your customers’ needs and actions. Urban Outfitters would have been better served by surveying their customers, asking them what they wanted to see, and create a personalization strategy based on their responses. And while Urban Outfitters paid for their mistake, B2B business offering expensive products or services with expensive contracts have even more to lose. It’s so important that you understand your buyer before you personalize – otherwise you risk the filter bubble. Behind every great personalization effort lies smart strategy and great high quality content. Personalization won’t work without these, so focus on this first. Once you have a strategy and great content, you have to think about the different profiles of your customers. Figure out what characteristics of your customers are relevant for your business. For example, an airline may want to prioritize geotargeting as a segmentation strategy, because there is no use showing someone in Dallas a list of flights leaving from Montreal. On the other hand, a company selling sports gear might be less concerned with geotargeting, and more concerning with gender and age as segmentation strategies. The point is, the the success of content personalization is built on a solid foundation of great content and a well crafted segmentation and targeting strategy. 5. Personalization can yield great results, but beware of the risks. Transparency – Let your customers know what information you are collecting about them, along with why and how you are using it. Accuracy – Don’t make the Urban Outfitters mistake. Make a strong effort to understand the needs and behaviors of your customers. After all, customers will seldom complain if they are presented with content that they actually want. Control – Give your customers the ability to edit, re-define, or turn-off the personalization. Trust – Your number one goal in using personalization should always be to make your customers’ experience better. If you do this, you will create trust between your brand and your customers. If you don’t do this, and use personalization with the primary aim of making more money, you risk your customers feeling exploited. Insight – Know what personalization is working and what’s not. Look at your analytics to see which of your personalizations is most effective. Target your low performing personalization and either remove or alter them. Content – High quality content is essential. An aspect of personalization is to target users with content they might be interested in. For that you need to actually have content that your users might be interested in. Strategy – You need to have a well thought out strategy. Who are your customers and why are they on your website? What pages do you want to personalize – just the landing page or multiple pages? What will your segments be, and in the case that a user falls into two segment buckets, which personalizations will you prioritize. These are all questions to think about – head over to chapter 5 and 6 for more guidance on this.